The Hoss Wheel Hoe is the ultimate tool for your vegetable garden! It is a multi-functional tool that allows you to cultivate, weed and maintain your garden, saving you time and energy. Our Wheel Hoes are built to last a lifetime because they are MADE IN THE USA with only the highest-quality components. Our Single and Double Wheel Hoes include the same handles and toolbar for attaching implements. The only difference is the extra wheel and longer axle on the Double Wheel Hoe. Most all of our attachments will fit either the Single or Double Wheel Hoe. A Single Wheel Hoe can easily be converted to a Double Wheel Hoe using our Double Wheel Hoe Conversion Kit, and a Double Wheel Hoe can be easily converted to a Single Wheel Hoe using our Shoulder Bolt accessory. See the descriptions below to see which option is best for you. The Single Wheel Hoe provides increased maneuverability and a smaller footprint than the Double Wheel Hoe. This makes the Single Wheel Hoe ideal for situations in which spacing between rows is narrow. Includes a set of 3 Cultivator Teeth. The Double Wheel Hoe has an extra wheel for added stability. The space between the two wheels allows you to straddle young plants and work both sides of the row in one pass. Includes a set of 4 Cultivator Teeth. “Hill” or throw dirt to plant rows. Use individually or as a set. Take out the largest weeds. Available in 12″, 8″ & 6″ sizes. Position blades inward or outward. Our Wheel Hoe Success Kit has all the items you need to maintain your Hoss Single or Double Wheel Hoe, change attachments, and keep your implements sharp and field-ready. 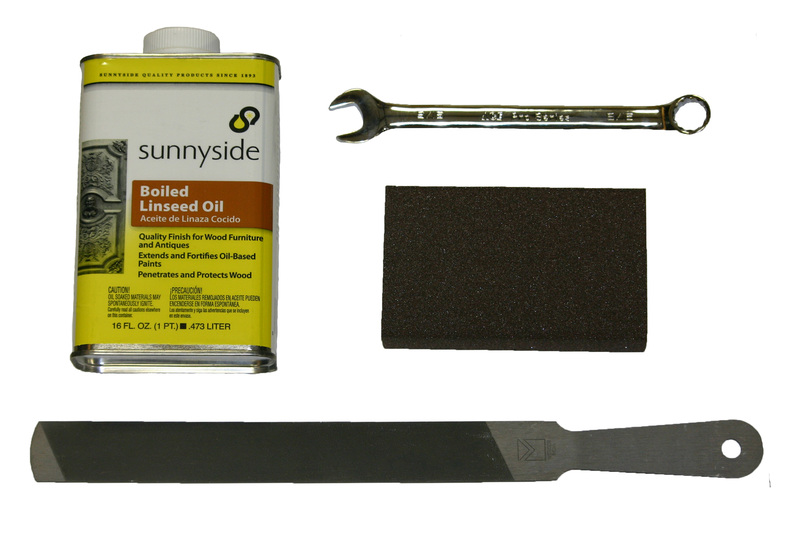 Boiled Linseed Oil (1 pint)– Apply to handles to condition and protect wood surface. 9/16″ Wrench – Use to change attachments on Single or Double Wheel Hoe. Medium Grit Sanding Sponge – Smooth wooden handles and metal surfaces on attachments. 10″ Farmers File – Easily resharpen blades on Wheel Hoe attachments. Save with Our Bundle Packages! A GREAT WHEEL HOE STARTER SET! 8″ Oscillating Hoe for weeding between rows. Left Plow blade for creating furrows and hills. Versatile Sweeps for weeding between rows. Plow Set for furrowing and hilling plants.